The Windows Phone 8 emulator runs as a virtual machine on Hyper-V, a new virtualization technology available in Windows 8. The Hyper-V on Windows 8 requires that your system supports Second Level Address Translation (SLAT). Note that if your PC doesn’t support all the prerequisites for running the Windows Phone 8 Emulator, you can still install the Windows Phone 8 SDK and develop apps but can only test on the real device. If you need to run Windows Phone Emulator, then you need to verify if your system supports SLAT. You can verify the prerequisites for the Windows Phone Emulator by following the below steps. 2. Open the Command Prompt in the Admin mode and change the directory of the command prompt to D:Coreinfo and type Coreinfo.exe -v in the command prompt and press enter key. 3. 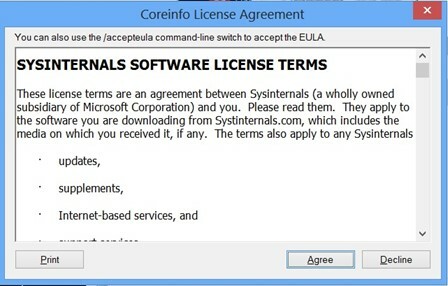 If you are running the tool for the first time, you will be prompted with the Coreinfo License Agreement. Click the “Agree” button. 4. 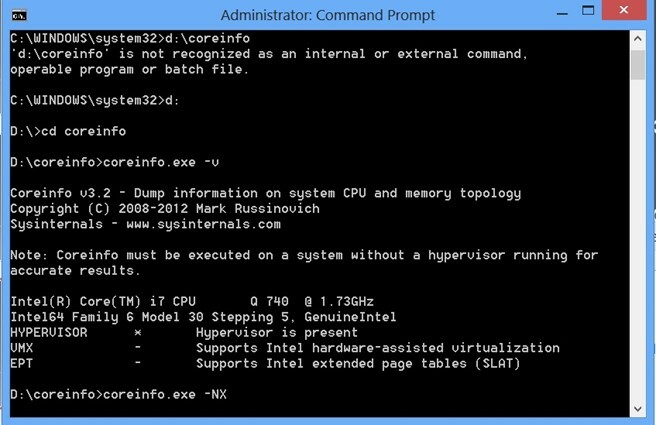 You should soon see the output of the Coreinfo tool which should provide you the information if the Hypervisor or SLAT is supported on your PC which is required for running Windows Phone 8 Emulator.